A test of a school's new gas cookers led to sprinklers being activated and the flooding of parts of the building. 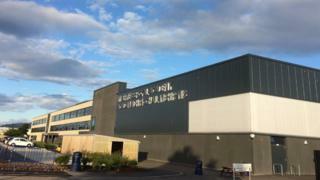 Highland Council said the incident on Wednesday evening has closed Inverness Royal Academy to pupils until next week. Water spread into a number of first and ground floor classrooms and corridors, including the library and kitchen. The secondary school is the largest and also one of the newest schools in the Highlands. It has about 1,000 students, but has a capacity for more than 1,400. Highland Council said the cooker test in the home economics classroom was being done by contractors on the instructions of Hub North Scotland and Morrison Construction, the two companies that led the construction of the academy. Head teacher Nigel Engstrand said: "I would like to thank the school and Highland Council staff who came into school overnight to help manage the incident and deal with the initial mop-up. "In spite of the challenges we faced in dealing with the incident and in getting the message out to pupils and parents, only four pupils turned up to school today out of our 1,050 school roll. "The most affected area is in a home economics room. "However, the library and some of the technical classrooms are also affected. "Due to the swift action of our staff they managed to save library books that would have been ruined." The secondary school opened last summer close to the site of the former school building, which was demolished.